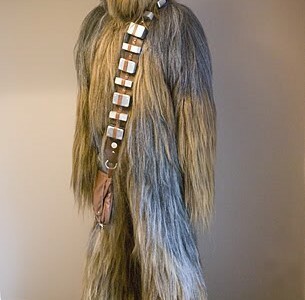 This impressive DIY Chewbacca cosplay suit posted on Buzzfeed.com looks like it’ll take quite a bit of time to finish. In the end, it looks like it’s worth it, no? It looks like the person made a mesh suit out of equipment bags (or laundry bags) and threaded the synthetic fur through it. I’m not sure what he used for the fur, it is possible that he used synthetic hair extensions . The images don’t show you how he uses stilts for boots though, which is too bad, because I’ve always wanted to be taller. The site also shows that he made a mask out of molding. Props to him, because I’m the lazy type and I probably would have saved time by buying the mask online . 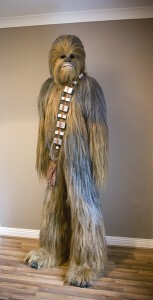 Not much more info on the site except for images on how he made the Chewbacca Suit, so it’ll be a bit of trial and error if you try this for yourself. Of course you can always try buying one yourself . Quality not guaranteed!